In many ways it was very much an anachronism in our lives, but for those of us who grew up around Dolla and Silvermines in the ’fifties, Kilboy and the ‘Big House’ will always have certain associations and memories. My own childhood home was just across the fields from Lord Dunally’s cropped mansion, and only a couple of hundred yards from the imposing ‘Buck Gate’ entrance. Yet, it might have been a foreign country, so exotic were its rhododendron filled woods, its man made lake and sylvan islands, its lawns and walled garden, not to talk of its inhabitants, who from our perspective lived fantastic lives with lots of servants. They even had a butler in the house. It was incredible to learn, years later from the pen of Terence Prittie, the writer and journalist son of the fifth Baron Dunally, that the family by then had fallen on hard times – genteelly ‘hard up’ is how he described their plight. Who would have believed it? Despite the elegant entrances it wasn’t a ‘gated estate’ in those days. In all my years in Dolla I can never recall the Buck Gate being closed, not to talk of being locked. 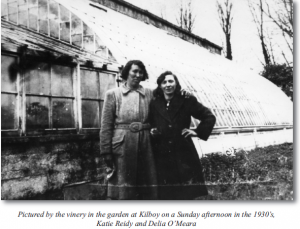 If you could negotiate your way past the O’Meara’s who inhabited the lodge and farmed around it, or past Mai Hogan and Pat who lived in the lodge at the Silvermines entrance, you had a veritable national park at your disposal. As kids we gathered wild ‘hurts’ in the woods, picked daffodils on the avenue and once, in a fit of nationalistic fervour, a group of us attempted to row a boat on the lake with the intention of invading an island and getting our own back on the usurper. Like many a rebel before us, we failed – unable even to untie the boat from its moorings in the boathouse beside the avenue. For all that, my First Communion flowers came from the garden at Kilboy, courtesy of our neighbour and friend, Johnnie O’Meara of the Buck Gate, who was gardener there for many years. I remember feeling a little bit uneasy about carrying a bunch of Protestant flowers on such an auspicious occasion, and had to reassure myself from time to time that we were only taking back what was ours – which just about sums up the attitude which all but the most loyal retainers had to the place at that time. The connection however went farther back. My parents met for the first time in Kilboy, in the middle of the Civil War, a short time before Michael Collins was shot at Beal Na mBlath and quite soon after the mansion, designed by William Leeson, had been burned to the ground by Republicans. He had served as a volunteer in the Silvermines Company of the Tipperary Number 1 Brigade and had taken the pro Treaty side. She was 16 years old and had gone there that day with a friend to loot the black currants in the garden. That night the Civil War was forgotten and they all went to the dance in the barn. The Lord and his family had fled to England and Kilboy was in the hands of the people – for a while at least. Like all great dramas, there was an element of farce surrounding the burning of Kilboy. The sixth Lord, Desmond Prittie, in his unpublished history of the family, claims that the house was set on fire by a group of schoolchildren after his grandparents had vacated it. “I’m sure they had a lot of fun. After all, it’s not every day of the week that one gets the chance to set fire to a Georgian mansion” he wrote with more than a hint of irony. According to Desmond, the staffs, both indoor and outdoor, were “marvellous”. “They threw everything they could out the windows onto the lawns, and the farm workers continued to turn up for work through heavily armed pickets.” One worker was so horrified when he saw the house going up in flames that he shot himself, according to the writer. The event had been presaged during the ‘Troubles’ when the Lord and the Lady were riding to church in the Silvermines in a pony and trap and the pony was shot from behind a hedge. Shortly afterwards when they were standing on the steps of Kilboy, a man fired a shot from behind a rhododendron bush and the bullet went straight between them, right through a window, lodging in the Grand piano. The story began on a very different note 274 years before that, in July 1648, towards the end of the second phase of the English Civil War, when a captain of a Kentish Regiment of Horse in Cromwell’s New Model Army routed a superior Royalist force at Kingston and paved the way for a significant Parliamentarian victory. It was a decisive event in English history and decisive too in the relatively new soldiering career of one Henry Prittie. The ripples too would soon be felt far from the banks of the Thames, in the Dunalley stronghold of Colonel John O’Kennedy, perched on a hillside near Silvermines, where an ancient order was about to be overturned forever. Just a year after his victorious assault at Kingston, Prittie was promoted to the rank of Major and was sent to Ireland in command of Cromwell’s new Regiment of Horse. By the time Cromwell’s bloody campaign was over he would be appointed in turn High Sheriff and Governor of Carlow and would eventually find himself in possession of the confiscated lands and castle of Colonel John O’Kennedy, taken over in 1650 and confirmed in a patent granted by Charles 11 in 1678 – for, of all things, ‘loyalty to the crown’. O’Kennedy was hanged in Nenagh with his son James, after being convicted of complicity in the murders of English and Dutch miners in Silvermines during the 1641 Rebellion – an atrocity reportedly carried out by his brother Hugh without his knowledge. The lands would remain in the possession of the Prittie family for over 300 years with a peerage included from 1800 for support for the Act of Union. The family seat, however, would be re-located three miles away to Kilboy, and the old castle founded by the O’Kennedy’s would over time fall into ruin. Kilboy in turn would, as Terence Prittie said in his memoirs, become “lapped up in a wave of history” and the family would eventually be forced to cut their long connections with North Tipperary. Ironically the estate would finally revert to an owner of Gaelic descent who would make it an inaccessible gated estate. Ironically too, just as the Prittie family was leaving Kilboy after 300 years, a Canadian mining company was levelling what remained of the historic O’Kennedy castle of Dunally, without so much as a protest from anyone. The castle is mentioned in Lewis’ Topographical Dictionary of Ireland in 1837 as “the ancient castle of Dunalley”. It would be practically impossible to capture the history of an Anglo Irish estate like Kilboy in a couple of thousand words. In any case most of the records are missing – lost when the house was burned down and also in the Custom House fire in Dublin in 1922. Anything that survived was bequeathed by Desmond Prittie to the National Library, including letters from the poet Robert Browning. In his own short history of the family, Desmond lists all the successors of the original Henry Prittie. The second Henry – the above mentioned who still lived in the castle at Garryard – was a Captain of Horse in the army of William of Orange. The third Henry married the daughter and heir of Colonel James Harrison MP of Cloughjordan, another Cromwellian grantee, and the union increased the Prittie lands to a total of 18,000 statute acres. The fourth Henry Prittie, who was married to Deborah, the widow of John Bayly of Debsborough, was MP for Tipperary from 1761 to ’68. The extended family now included some of the leading Anglo-Irish families of Munster, including the Crokers of Ballinagarde, Limerick, one of whose successors was the notorious Tammany Hall chief – Boss Croker. The fifth Henry became the first Baron Dunalley – receiving a ‘Union peerage’ on July 31, 1800, in return for his support of the Union. 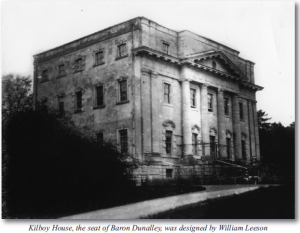 He was living in splendour in Kilboy House completed 20 years before the peerage and described as the most important house designed by William Leeson. He was MP for Banagher, then for Gowran and finally for Tipperary, and was married to Catherine, the daughter of Francis Sadlier of Sopwell. His first son, Henry the second Baron was, according to Desmond Prittie, a supporter of Catholic Emancipation and insisted on paying the tithes of his tenants, believing that it was unfair to ask Catholics to support the Protestant Church. He married twice but had no children, and it is through his second son, Francis, that the family descent continued. When his first wife Martha Otway of Castle Otway died, Francis married Elizabeth, only daughter of the Right Hon George Ponsonby, Lord Chancellor of Ireland, who had, ironically, opposed the Act of Union. Their son Henry – the third Baron – married Anna Maria Louisa O’Callaghan, the daughter of Viscount Lismore, and the O’Callaghan name continued in the family up to modern times. The fourth Baron, Henry O’Callaghan Prittie was educated at Harrow and Cambridge and fought with the Rifle Brigade in the Ashanti War 1873 – ’74. He was Lieutenant for County Tipperary and later High Sheriff. He was a representative Peer and honorary Colonel of the 3rd Battalion, Royal Irish Regiment. The fifth Baron, also educated at Harrow and Cambridge, was wounded at Gallipoli in 1915. He took over Kilboy in 1927 with his wife Beatrix Evelyn Graham, and their son Henry Desmond became the sixth Baron. Desmond served with the Kings African Rifles and took part in the advance to Addis Abba when Italy entered the war. He also served in the Western Desert with the 7th Armoured Division, and in the invasion of Italy. He finished the war in Ceylon and Singapore. His brother Terence became one of the most famous foreign correspondents of the Manchester Guardian and was awarded an MBE. He wrote several books including a memoir “Through Irish Eyes” in which his young life in Kilboy is fondly recalled. He described his childhood home as “the handsome house in the trees”. Desmond married Mary Philippa Cary a niece of the 13th Viscount Falkland. The increasingly difficult struggle to hold on to the estate in an independent Ireland ended with them. Kilboy was sold in 1968 to an Irish American named Norman Butler, who sold it a few years later to Tony Ryan, the founder of GPA and Ryanair and multi millionaire son of a train driver from Thurles. The seventh Baron Dunalley, Henry Frances, born in 1948, lives now in Scotland with his wife and family. Educated at Trinity College Dublin, he worked for many years as a Probation officer with the British Prison Service and was based at Oxford. He received some of his early education at a private school in Silvermines run by the wife of a mining manager named Moorehead. I remember him travelling to school on the bus from Dolla for a short time. He got off at Moorehead’s Bridge while the rest of us travelled as far as Siney’s shop. His sister Mary Rose is married to a Connemara sheep farmer named Joyce and their eldest daughter is a Pharmacist in Aberdeen. The third child of Desmond and Philippa, Michael St John, lives in the US. History’s circle has been completed, but its twists and turns continue to amaze us. The Land Acts, particularly the Wyndham Act of 1903, set the ball in motion for the final disintegration of the once vast Dunalley estate but interests remain to this day in the family name. As late as a couple of years ago, the seventh Baron returned to Silvermines to hand over a plot of land required for the new school playground which he gave for a nominal sum. It was his father who had sold the mining rights of the extensive lead and zinc lode discovered three decades ago to the Mogul Mining Company of Toronto, the proceeds of which he used to establish a trust for his children. The Dunalley interests in the mining of the area and in the village itself should be fodder for a future article. The convolutions of history in relation to Kilboy struck me forcefully on two occasions back in the seventies. Once was when I was interviewing the late Dan Morrissey, former Fine Gael TD, and ex Minister for Industry and Commerce and later for Justice in the first inter party Governments. His early life as a manual labourer included a spell in Kilboy, felling trees for Lord Dunalley. He told me that one day in the late 1960’s when he had retired from a remarkable political career and was still running a highly successful auctioneering business in Dublin, he had a visitor to his office in Merrion Square – Lord Dunalley looking for a job. The second occasion in which I marvelled at the turn of history was when I was sent out from the Nenagh Guardian to interview the then new owner of Kilboy, the late Tony Ryan who had just introduced a herd of Blonde d’Aquintaine cattle to Ireland. My brother John was with me on the occasion and when we told him that we had grown up looking across the fields at the ‘Big House’, he invited us in to savour the view from the other side. Desmond Prittie acknowledges in his story that the “cruelties inflicted on the Irish in the Cromwellian Plantation were unspeakable” and refers, not only to the banishment of Irish landowners to Connaught, but to the transportation of thousands, including women and young girls, as slaves to the West Indies. Nevertheless, it is academic now to speculate on what life would have been like for the ordinary people of Silvermines and district if Colonel John O’Kennedy had held on to the castle of Dunalley and if the dispossession of the Gaelic chiefs of Ormond in favour of Cromwellian soldiers and adventurers had never proceeded. Whether a native ‘gentry’ would have made the lot of the common people much more bearable over the turbulent centuries that followed is arguable, even if the very idea is hard to even countenance from our own historic perspectives. 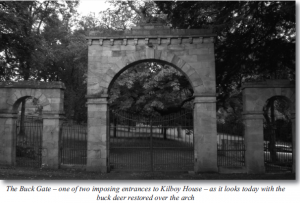 Certainly, the Dunalley estate which in the 1870’s totalled 21,000 acres was no holiday camp for the tenants. The ‘Tipperary Advocate’ of May 29, 1867, reported the story of an eviction in Lisnageenly of some families of the Ryans who had appealed to “His Lordship, proverbial for his kindness and humanity” not to proceed with a demand for possession. The paper reported the arrival of the Sheriff and police and “the crowbar brigade of ragamuffins from Nenagh” who evicted the families and demolished most of the houses. The Ryans were rescued from the side of the road by Sam and John Brindley who placed Happygrove and Ballincara at their service. For all that, Kilboy, with all its mystique and ‘otherness’ was a landmark in our lives and is still a landmark in our memories. Its inhabitants may have been slightly exotic – even eccentric at times – but maybe that’s what you’d call a clash of cultures and traditions. Sometimes that divide was bridged. Among the items lodged in the National Library by Desmond Prittie was a children’s story written in 1897 by John Ryan of Cooleen, head gardener at Kilboy. The title of the story was “The Hunting of the Black Fox” and it was written for the “Hon. Miss Prittie”. The grievous wrong perpetrated on our forbears may rankle with us still, but the workers and tenants of Kilboy were our neighbours and friends, and that alone was enough to foster the strange symbiotic relationship we all had from time to time with the Big House.